I've been active on the suggested edits queue recently, and I'm wondering just how many suggested edits Stack Overflow gets a day. I'd also like to learn how to use the Data Explorer look these kind of things up myself. I've tried searching on the data explorer, and https://data.stackexchange.com/stackoverflow/query/new is very intimidating as I've never used it before, and it just provides a list of 100s of column names and a textbox. I think I want to count SuggestedEditId where no null in a 24 hour period, but I'm unsure how to write that query. Some support learning and using this to accomplish my particular query would be appreciated. Not the answer you're looking for? Browse other questions tagged discussion support data-explorer . Why are suggested edits not allowed Meta Stack Overflow? 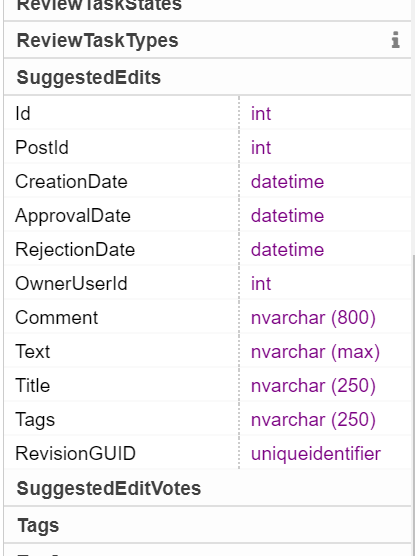 How can someone see suggested edits in Stack Overflow? How many first-time questions are asked on Stack Overflow each day?